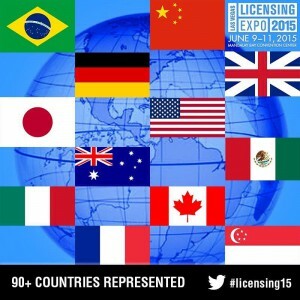 Snotes is excited to be exhibiting at the Licensing Expo, June 9-11, 2015. The convention will take place at the beautiful Mandalay Bay Convention Center in Las Vegas. The Licensing Expo is the largest show of its kind; in 2014 the show attracted almost 500 exhibitors, and 5,000 brands. 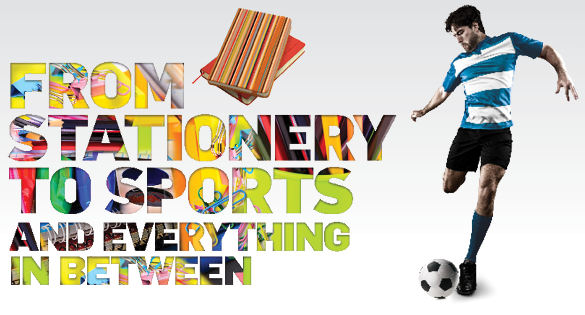 We will be keeping company with artists, celebrities, characters, sports figures and more. This high level B to B marketplace brings companies such as ours, together with a global audience of 15,000+ key decision makers, licensees, retailers, agents, and manufacturers. It’s a great opportunity for Snotes to expand our brand into new product categories and territories, create brand collaborations, develop exclusive product lines for retailers, and partner in new media such as digital, TV, online gaming and entertainment. Each year billions of dollars of licensing business is conducted between the exhibitors and attendees; we are excited to be a part of the mix. YouTube sensation Bethany Mota will be in attendance, as well as several high-level CEOs and Vice Presidents from companies such as Nintendo, Global Brands, Toys “R” Us, and Hallmark. Attendees to the conference are also invited to learn the latest in branding strategies and receive expert advice from more than 25 conference sessions. Snotes licensing proved to be a great success for McCarthy Construction. Learn more about how they utilized Snotes to create a memorable showing during and after their tradeshow presence; Snotes, along with a well-planned marketing strategy produced positive results that they hope to mimic in future expo events. If you, or someone you know, will be attending the expo, make it a point to stop by the Snotes booth, we will be located at H13. Also, connect with us on Facebook and Twitter to talk up #Licensing2015. If you are interested in licensing Snotes for your company’s marketing, products and/or services, contact us today! Learn more at our website, reach us via email or call 314-791-7711. Snotes is a Big Trade Show Hit! We know what it is like to have a dream and work to make that dream come true. Snotes started as a dream, and now to watch it all actually happen is such a delight! Ask successful business owners and they will have their own story to share about how their business began as a dream, and how that dream, along with a lot of hard work, led to their success. One of the biggest challenges that businesses face, no matter how successful they are, is the need to stay top of mind with current customers, as well as catch the attention of new customers. For the latter we have a solution; a business must do something unique and noticeable and for this, we offer Snotes. Recently, Snotes completed an agreement with a large construction company, McCarthy Construction. McCarthy has offices in 15 U.S. cities and, per Forbes, is ranked at #141 in America’s Largest Private Companies. During their attendance at an ASHE (American Society for Healthcare Engineering) conference, McCarthy handed out printed Snotes to tantalize conventioneers. Visitors to their booth came and learned how to read the McCarthy Snote, engaged with McCarthy employees and were then entered into a drawing for one of several Selfie Sticks. 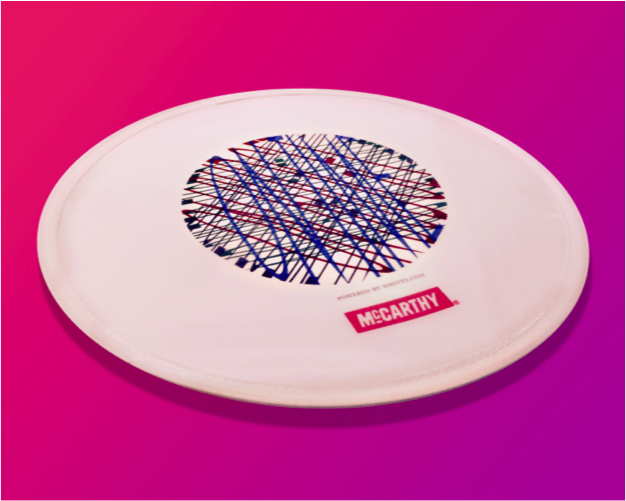 As part of their giveaways, McCarthy had indoor (fabric) Frisbees created with their Snotes message. Can you even imagine seeing all those Frisbees flying around the exhibit hall! To show their appreciation for those that came by their booth, they followed up with an amazing video of a Snotes Thank You Card! “Snotes was labeled a success at ASHE. We had more than 100 entrants to win the Selfie Sticks (they had to decode the message and provide their email and contact info). People engaged with the messaging and hung around to figure it out which allowed more interaction about McCarthy healthcare construction. If you are interested in licensing for your company’s marketing, products and/or services, contact us today! You can reach us via email or call 314-258-0445.